I don't know about you, but I'm pretty sick of winter. I live towards the north of England - where, I'm reliably informed, it's 'grim' - and by this time of year, I'm usually beginning to wonder if I'll ever see the sun again. So I expect, like me, you'd much rather be thinking about holidays somewhere warm and sunny than what you should be doing with your depleted log pile. The truth is though, that if you want logs that are nice and dry to burn next winter, you need to start thinking about it now. Freshly cut wood is around 50% water and you really do have to be quite intentional about drying it out before it will make good fuel. Cutting it and just leaving it in a heap somewhere, while being a good start, will not by itself leave you with high quality logs. In fact it's more likely to leave you with a high quality habitat pile - good for your local environment, but not that useful for heating your house. To dry wood thoroughly you need to take two things into account. Firstly, the wood already contains water, which you need to remove; and secondly, given the British climate, the wood is likely to gain additional moisture from the surrounding environment - which you need to prevent. Both of these problems can be overcome by effective processing and stacking. 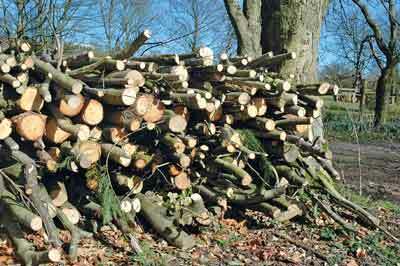 This time of year, many suppliers are beginning to run low on seasoned logs - it is in their interest to run down the stock by the end of the winter - but they may well already have some green material ready for processing. Failing that, you can probably get plenty of green logs from local tree surgeons if you don't mind what shape and size you get. 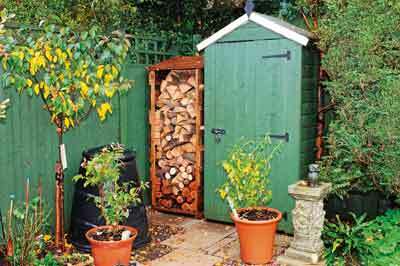 Buying green logs can be a problem later in the year, but it's nothing to worry about now, as you've got all year to dry them out, and if the supplier doesn't have to dry the logs, then you might find you can get them a bit cheaper. 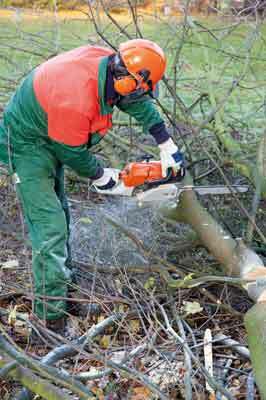 Logs that have been cross cut and split will dry faster than long lengths. The rate of drying is directly influenced by the distance any water has to travel before it is able to evaporate away from the log's surface. Larger logs will take longer to dry, and so will logs that still have the bark attached. The bark is an effective barrier to moisture - one of the functions it provides in the living tree - and a log with a split face will dry more quickly than a log of equal size which still has bark on. 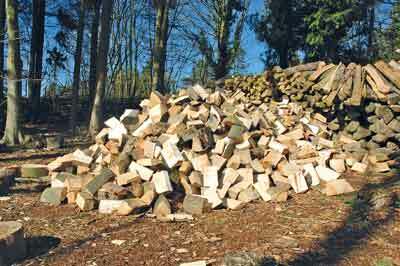 A viable alternative to processing all of your own logs - which is also kinder to your back - is to buy logs part or completely processed. There is probably an interesting - to me at least - study to be done on the relative locations of log piles. The objective is to gain the maximum benefit from sun and wind over the summer to dry the wood out, while protecting the stack from rain, floods, theft and arson as well as being suitably convenient for you to bring logs in during the winter. There does seem to be a natural law of the universe, which means that you'll need to get more logs as soon as it starts snowing, or when it gets too dark to go out without a torch. If you've got space in a shed or garage, then that's ideal, but anywhere out of the rain and relatively close to the house will do. 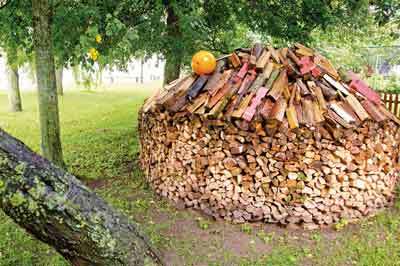 Recently, a Norwegian national television station broadcast a 12-hour programme on the subject of burning wood correctly. It sparked a national debate. Not, as you might think, on whether it was a good idea to broadcast such a long programme, but on whether it was better to stack logs bark side up or bark side down. I am not going to court controversy by suggesting one is better than the other - the population in Norway were evenly divided. You do, however, need to make sure that 1) your stack is able to breathe and 2) it is not going to re-wet from any nearby source. Dry wood acts just like a sponge and will happily reabsorb water when it's allowed to. Ideally you want your stack to let the breeze through as much as possible. It's tempting to stack against a nearby wall, but you do run the risk of causing damp patches on your brickwork. If you do stack by a wall, it's best to make sure that there is an air gap to allow the ends of the logs to breathe. Remember that wood is basically a bundle of tubes that transport water from ground level into the tree canopy. This means that water moves much more effectively along the grain rather than across it - especially if the wood still has bark on. To prevent re-wetting, you need to take into account water moving up from the ground and down - or depending on your location, sideways - as rain. Ideally you want to make sure that your stack is on bearers which prevent moisture being attracted to the bottom of the stack. These can be any old bits of wood you're not going to burn - like fence posts with preservatives in, or old pallets. Preventing rain is a fairly straightforward process of getting some old fence panels or tarpaulin and covering the top of the stack. Remember that you want free air-flow so don't bother covering the sides tightly as any airtight surfaces will have a tendency to sweat in the summer. Personally, I think a dry autumn would be very nice. Realistically, though, I'm expecting something that looks more like a monsoon to emerge. Drying wood is going to be a challenge, so let's all get ready!